The Freedom Experience giveaway includes tickets, resources, and t-shirts. The window to score the early bird rate for Mercy Multiplied’s upcoming Freedom Experience will soon close. February 15th is the final day to get the $60 rate for this power-packed event held March 11-12 at Christ Church in West Monroe, Louisiana. The Freedom Experience will feature Mercy’s Founder and President, Nancy Alcorn, and other top Mercy Multiplied leaders. Special guests will include Dove Award winner Ellie Holcomb, who will lead the praise and worship segments, and Duck Dynasty’s Kay Robertson, who will co-host the VIP luncheon with Alcorn. The two-day conference is meant to be both a practical and powerful resource to individuals or organizations seeking to learn the life-transforming principles taught for over 30 years within Mercy’s residential homes. Alcorn and her Mercy team will cover the seven keys to lasting freedom that have helped thousands redefine their lives. The keys include: committing fully to Christ; choosing to forgive; renewing your mind; breaking generational patterns; healing life’s hurts; conquering oppression; and learning principles of lifelong success. In addition to the early bird rate, Mercy is also offering a social media contest for the chance to win a “Freedom Pack” for two valued at $270. 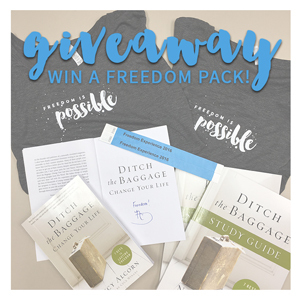 The prize includes two VIP tickets to the event, two signed copies of Alcorn’s new book Ditch the Baggage, two corresponding Ditch the Baggage Study Guides, and two Freedom is Possible T-shirts. Entries can be made through Facebook and Instagram. All entries must be completed by Friday, February 12th at 9:00 a.m., and the winner will be announced that afternoon. After February 15th, tickets may still be purchased for the Freedom Experience for $75. A limited number of VIP tickets can also be purchased for $100 and include a signed copy of Ditch the Baggage, preferred seating, and a private luncheon with co-hosts Alcorn and Robertson. For more information about The Freedom Experience or to learn about sponsorship opportunities, visit www.MercyMultiplied.com or contact Dana Owens at dowens@mercymultiplied.com or at 318-372-5575.